When we set off from Middleburg we were pretty wiped out from the previous days long ride and it was raining, so we cheated, sort of and got on the train with our bike to ride the 10 miles or so to Vlissingen where we hopped the ferry to Veerhaven. Once we arrived on the other side of the Westerschelde the weather started to clear and we set off for the Belgian border and Bruges. Just before crossing the border we stopped in the small town of Sluis and had a great lunch at a small restaurant on the town square. Departing Sluis we found the Damse Vaart Oost canal, which we would ride along all the way into Bruges. It was one of the nicest stretches of our ride with beautiful scenery all along the way and perfect weather. There really was not much of a border at all, just a subtle change to the road signs in Belgium. Much more noticeable of a change was the architecture, which was somehow more rustic with traditional buildings and with more modern homes dotting the roadside than we saw in the Netherlands. Once we arrived in Bruges we checked in for our two night stay at the Hotel Cordoeanier, locked the bikes up for a couple of days and explored the small center of Bruges on foot. Beth broke her “no shopping” oath with the purchase of a couple of very nice leather bags and I purchased a couple of canvas panniers at to carry our expanding load on the bikes. 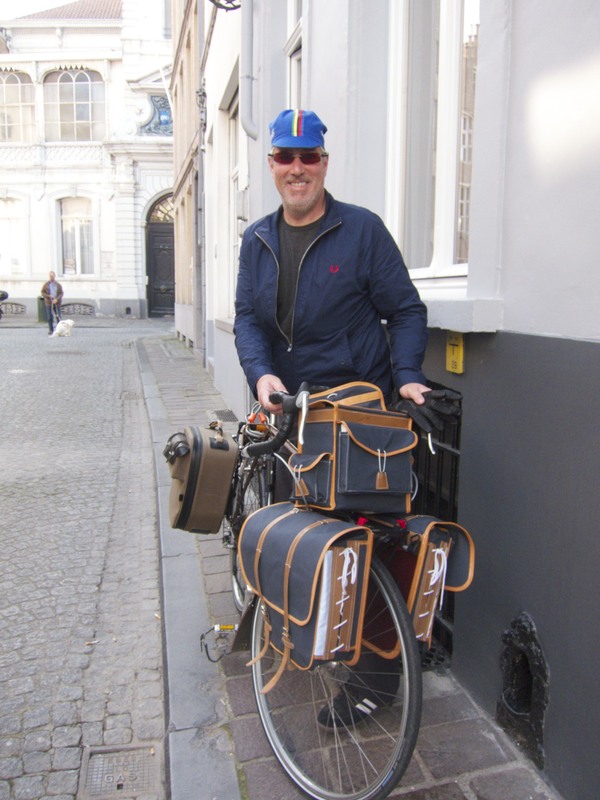 The Giles Berthoud panniers are a classic item that matched the front rando bag of my bike, we found at what became my favorite shop of the whole trip, Exceller bikes in the center of Bruges. The city of Bruges was probably the most beautiful of any that we visited on our trip and walking along the canals and narrow streets and soaking the art, architecture, food, drink and lifestyle was I think what sealed the deal for both Beth and I and firmly cemented our plans to move to this part of the world. Ghent and Antwerp were our next two stops and of the two Ghent was the one we enjoyed more. The B&B was run by a lovely artist and was just blocks from the center of town. We managed to see the famed Ghent altarpiece as well as see some of the beautiful views from top of the clock tower and find a really cool dicey bar thanks to Beth’s willingness to walk down dark alleys in strange places. The rides between Bruges, Ghent and Antwerp were unremarkable in the sense we had become somewhat acclimated to the architecture and pretty much took it for granted that there would be beautiful scenery and well signposted dedicated bike paths to get us wherever we needed to go…a luxury I still miss. As it turned out our time in Antwerp was a little unusual, Beth got the explore the city on her own for a while while I tracked down a bike shipping bag with the help of the guys at Fixerati. A nice young gent named Dennis who was hanging out at the shop rode with me 15km each way to the big sporting goods warehouse on the outskirts of town that had one in stock so I bought him a tasty Fixerati beer when we got back to the shop.